Credit unions are seeing growth with loans, including fixed-rate mortgages. That's according to our Credit Union Trends Report for August 2017. 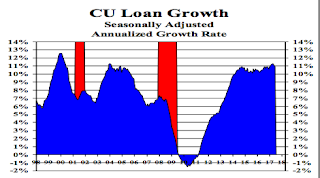 The nation’s credit unions increased their loan portfolios 1 percent in June, slightly less than the 1.2 percent pace reported in June 2016, and 10.9 percent during the last 12 months. Credit union fixed-rate first mortgage loan balances grew 2.7 percent in June, faster than the 2.2 percent reported in June 2016. As of June 2017, CUNA estimates 5,911 credit unions were in operation, 11 fewer than May and 215 fewer than June 2016.